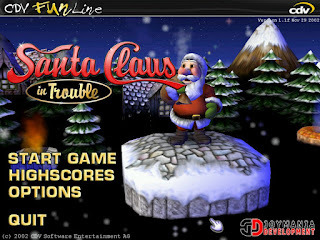 Since christmas is within a week, I decided to reinstall one of my favorite christmas holiday games: Santa Claus in Trouble. 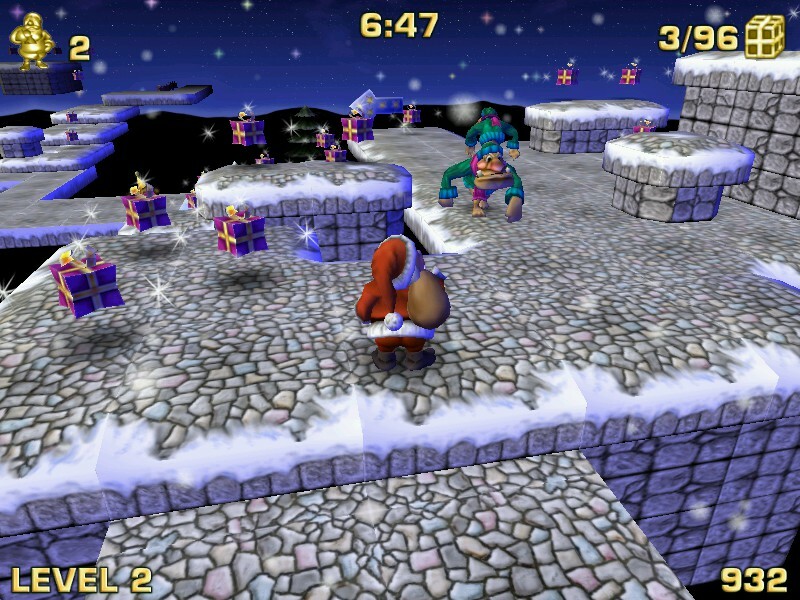 This game has always put me in proper christmas mood and it's something I first played long time ago when I was a kid. There used to be this Finnish computer magazine called Kompuutteri-lehti. It always came with some demo cd's called Kompuutteri-discs with it, and one of them had Santa Claus in Trouble. I should try to find all those discs and write something about them.. 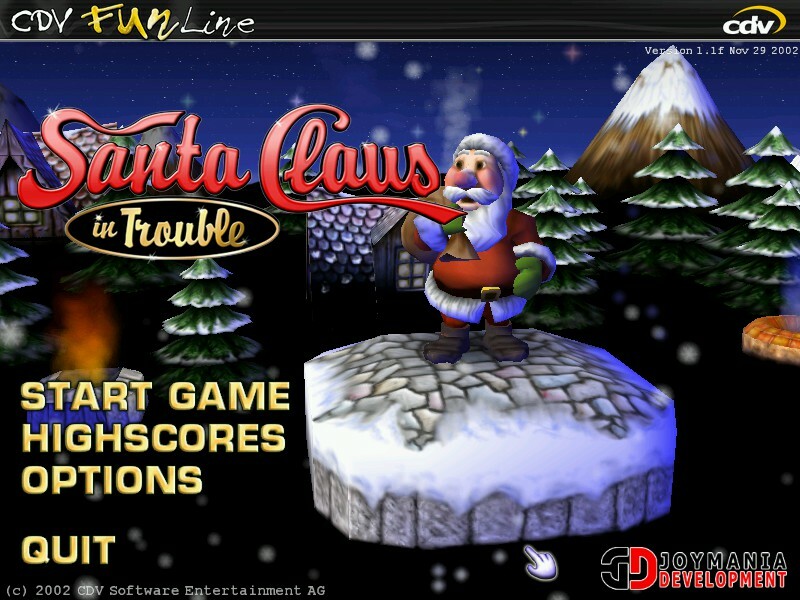 Anyway, back then I thought it would be a fun christmas game to play, especially after the disc mentioned it was completely 100% free and not just a demo. The game was made by CDV Software Entertainment and Joymania Development in 2002, and I think I got the disc around the same year. CDV was a publisher with lots of games under their belt, so this game was a free christmas gift to their fans. 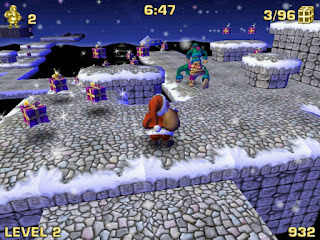 Santa Claus in Trouble is obviously full of christmas. Even the installer has very cheery christmas music. As far as I know, the story is just "Help Santa collect all the missing presents!" which is fine by me, I didn't expect anything more in-depth than that anyway. The game is actually a pretty solid platformer, where you jump around rooftops (or whatever they are) and collect presents, dodge trolls and try not to fall in the darkness that looms under the rooftops. Santa is quite nimble too as he can double jump. 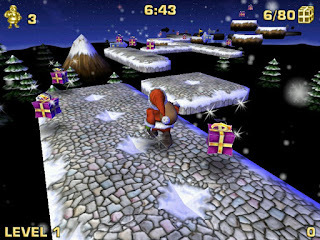 You use arrow keys to move and turn Santa around and jump with spacebar. Alternatively you can use a joystick or mouse+keyboard, but that didn't work for me because I have dual monitors and the mouse always escaped the game screen, since it isn't locked to the game. On modern systems you have to set Windows XP compatibility mode for the game, otherwise it doesn't work at all: The physics calculations will crap themselves and Santa animations spazz out. The game just gets really weird. But compatibility mode solved all the problems. As far as I know, there's ten levels of content, but I have actually never made that far. When I played this while back, I always either got tired of the game in the middle of it, or never reached the end. My little brother had beaten this game many times though, he used to play nothing else than this during December which was quite amusing. He obviously was way better than me in these type of games anyway. One of my favorite memories about this game happened back in December 2007 or 2008. My friend, let's call him Bob for now, visited me and I showed him this game. I thought the game was genuinely good, but he thought it was just silly. I don't blame him, the game looks a bit silly. Still he wanted to install the game to himself and try it out, so I visited his place and we installed it. Next day I get a phone call from Bob, but on the phone it wasn't him, it was one of his other friends. "Hey I saw that Santa game on Bob's PC, I really wanna try it, it looks amazing. Can I get the disc too? I would love to play it and I mean right now!" he said very excitedly. I chuckled a little, I didn't expect anything like that. It was already rather late, cold and dark because Finnish winter, but I still agreed to deliver the disc. Bob, his friend and I lived like 500 meters from each other, so I didn't mind at all. Bob and his friend were waiting outside for me to arrive and I gave the disc to them. I told them I couldn't stay since it was really late, so I went back home. They went together to install the game. Next day at school Bob's friend approaches me and returns the disc. He goes on and on about how fun game it is. This made me really happy since I had made someone else happy. Spirit of christmas, I guess? And that's why this game holds a special place in my heart: I had made someone happy with such a simple gesture. It also reminds me of those days when people just borrowed cd's from each other to install games and tried them out. This was more fun though since it was a free game, so I could just share it to anyone who wanted it, and they didn't need to have the disc to play it. Unfortunately, this game can't be found on CDV's official site anymore, but don't worry, here's a christmas gift: Download link! The link is safe, I used it to download the game too, and it was in the description of LGR's video about the game and I trust this guy 100%. According to him there's also a sequel, but I never got to try that unfortunately. Maybe one day though. 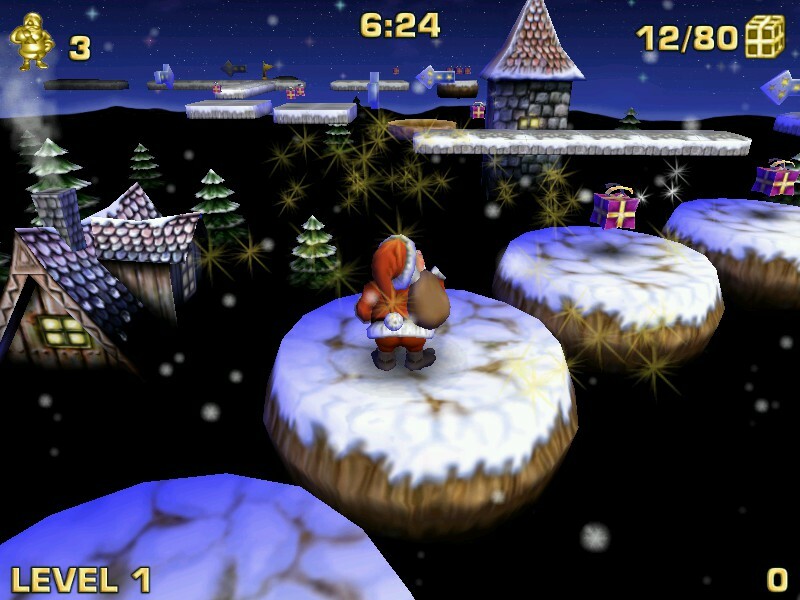 In conclusion, Santa Claus in Trouble is a very christmas-y platformer that is perfect for those cold winter nights to keep you smiling. Merry Christmas everyone and happy holidays! Or should I say: Hyvää joulua!